The holiday season is often viewed as a threat to our healthy routines, but our behaviors actually often take a positive turn during this time. More evidence now highlights that when it comes to optimizing health, how we eat is just as important as what we eat. 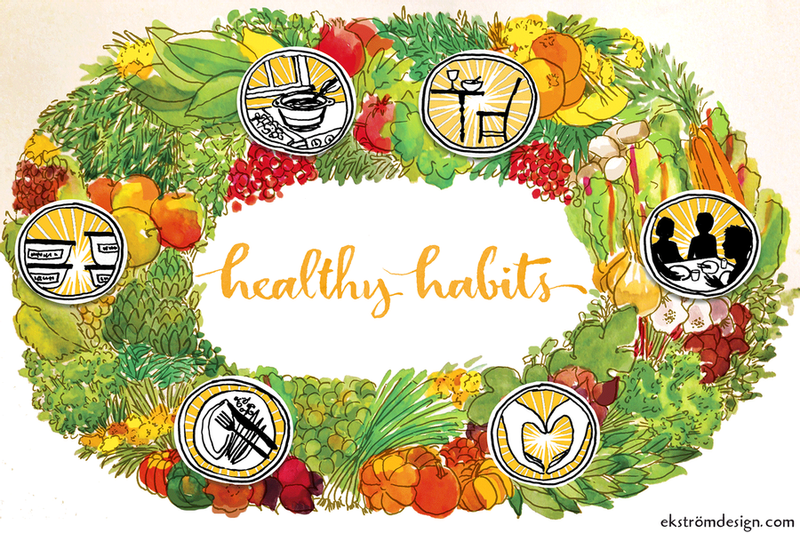 Sun Basket's Director of Nutrition, Lindsay Kane shares six healthy holiday habits we can embrace every day. The holidays are able to get us into the kitchen and cooking in a way that we rarely do the rest of the year, yet preparing your own meals is one of the best strategies for optimizing health. People who cook for themselves eat more nutrient-rich foods and less salt, sugar, processed oils, and preservatives than those who rely on food prepared outside the home. Make it stick: Start by cooking at least one more meal per week than you typically do. Repeat until it becomes your new normal, then add another day to the mix. Pro tip: Upgrade your Sun Basket subscription to four meals per week, using extras for lunch. You know how much you look forward to that refrigerator full of turkey, gravy, and cranberry sauce to make into sandwiches once the holiday is over. Imagine always having healthy food on hand for an easy lunch or dinner. If you adopt the holiday habit of cooking with leftovers in mind, you can live your own version of the weekend-after-the-holiday all year round. Make it stick: Spend a few hours on the weekend batch cooking some of your favorite recipes to eat later in the week. Pro tip: Double up on your favorite Sun Basket meals so you have extra servings on hand when you need them. You don’t have to use the good china, but the simple act of putting your food on a plate, rather than eating straight from a take-out container, can benefit your health. Think of it as a built-in portion control system. A plate prompts you to think about how hungry you really are before going back for seconds. Conversely, eating directly from the fridge, a take-out container, or a bag opens the floodgates to mindless munching. Make it stick: Ditch the eating-out-of-the-bag habit and commit to using a plate for every meal. Approach it as an opportunity to turn a blank canvas into a colorful, balanced, and thoughtful meal that you can feel good about. Pro tip: The size of your plate matters. Choose smaller plates to make portions appear larger and more visually satisfying. In everyday life, we often eat standing or on-the-go. Sitting helps you slow down and be present. The more attention we can commit to the food in front of us, the more likely we are to make healthier choices, and the more likely we are to recognize when we’re full. Make it stick: There will always be times when eating on-the-go is unavoidable, but when at home, enforce a no-standing-and-eating rule. The good news is that if you commit to more home-cooked meals and eating from a plate, these supporting habits will nudge you to sit down to eat, too. Eat with people, not computers. During the holidays, we eat with family and friends, but other times, it’s too easy to turn to technology as a dining companion. Multitasking while eating sounds like a time-saver, but studies show that eating while working distracts us from internal cues and can lead to overeating. Also, eating while working can lead to an internal connection between stress and food. Repeat this behavior enough and your body will begin to misperceive stress as a stimulus to eat the same way Pavlov’s dog drooled at the sound of a bell. Make it stick: Invite some friends and coworkers to join you in the break room for lunch a few days each week. This will encourage you to manage your time more effectively, keep coworkers from scheduling meetings at lunch, and protect your meal time from the stressful work hustle. Bonus: Countless studies have found that regular breaks away from your desk increase productivity and cultivate creativity. If Thanksgiving is the only day of the year that you reflect on what you’re grateful for, you’re missing out on an important ritual. Researchers have found that expressions of gratitude can lead to an increased sense of optimism. These moments of thankfulness remind us to stay rooted and appreciate what’s most important. Make it stick: Take 30 seconds before every meal to breathe deeply and express your gratitude. There’s so much to be thankful for, whether it’s the food on your plate or the people in your life. Positive thoughts make your meals and your life more fulfilling.